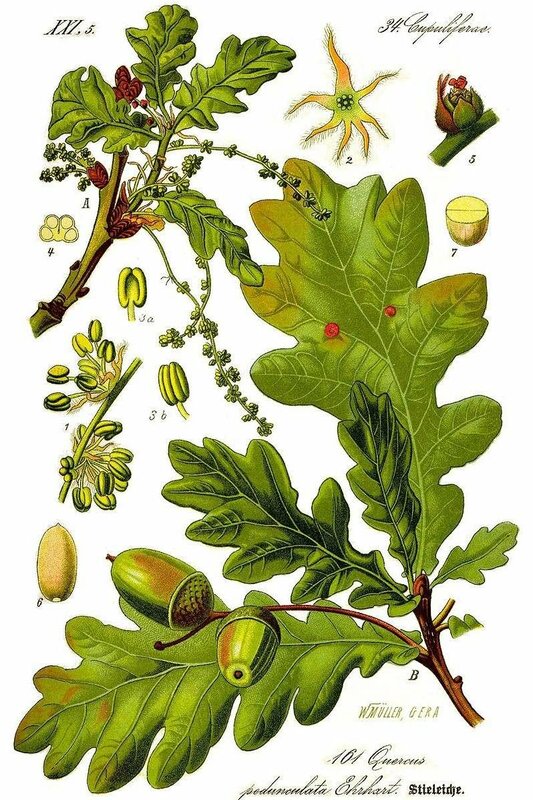 In spite of their namesake and the most known and loved British tree and assuming the staus of a national emblem, the English Oak is native to the northern hemisphere, and can be found from cool regions right through to tropical climates. The English Oak is a large, symbolic deciduous tree that can reach up to 40m. As the tree matures it forms a broad spreading crown with sturdy branches beneath. Their open canopy enables light to penetrate through to the woodland floor, allowing blue bells and primrose to grow below. Its bark is silvery brown and becomes rugged and deeply fissured with age. Its leaves are approximately 10cm long with 4 – 5 distinctive rounded lobes and short leaf stalks (petioles). Its flowers are long yellow catkins (a slim, cylindrical flower cluster), which distribute pollen in the air. Its fruit, or acorns, are generally 2 cm long borne on lengthy stalks and held tightly by cupsules (the cup-shaped base of the acorn). As the acorn ripens it turns from a green colour to an autonomal brown, and loosens from the cupsules before falling to the woodland floor. Most acorns will never get the chance to germinate, they are a rich food source for many wild animals; wild boar, jays, mice, squirrels and even roe deer. Acorns need to root and germinate quickly to prevent drying out or becoming victims of the harvest. Acorns are not produced until the tree is at least 40 years old. Peak acorn fecundity usually occurs at around 80 – 120 years. Oak tree growth is particulary rapid in youth but gradually slows at around 120 years. Oaks even shorten in height to extend their lifespan. The English Oak is held in high regard across most cultures in Europe. The oak was sacred to many gods including Zeus (Greek), Jupiter (Roman) and Dagda (Celtic). Each of these gods ruled over thunder and lightning, and oak trees are prone to lightning strikes as they are often the tallest living feature in a landscape. Druids frequently practised their rituals and worshipped in oak groves and cherished the mistletoe that frequent oak tree branches.